Yesterday I was organizing my system and found log files from an old MSN account I had which I used mainly for chatting with friends. I decided to enable the account in Pidgin and see if the account still worked. When I tried logging in to the account it didn’t let me because I guess the account had gotten locked down due to inactivity. So I went to the MSN site and tried to login to the account. At first it didn’t let me, so I tried resetting the password for the account. But that didn’t work as I couldn’t remember what information I had initially filled when creating the account so I asked the system to email me the password reset instructions. Now came the funny part. The system was going to email me the password reset instructions to the same account that I was requesting the password reset for. Below is a screenshot I took of the process. 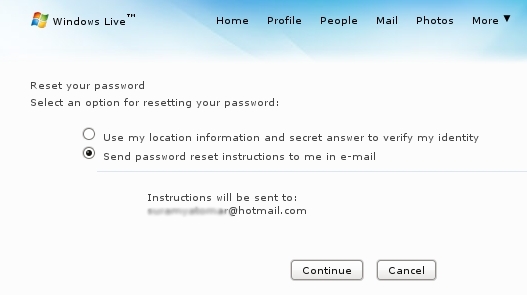 How I am supposed to access the account to get the reset instructions is something that they didn’t quite explain. The funny part is that the system finally let me login with the same password I had tried with originally. *shrug* Atleast it worked, though I am surprised that the account wasn’t deleted considering I hadn’t logged in for over 2 years.